Following the insights we gained through our interviews we further cooperated with the BLISTA to make a Day in the Laboratory available for every visually impaired student and not just a few selected few. Find below, how we prepared for these two laboratory days and what means we undertook to encourage more visually impaired people to become interested in Science and decide on biology or chemistry as their study subject. To understand the educational methods used for addressing the visually impaired, we visited the Carl-Strehl Highschool. We took part in their science classes and later teamed up with teachers to explore the various tactile representations they use to convey complex scientific phenomena and processes. Figure 1: Our team member Benjamin self-testing his blind orientation capabilities. Some of us experienced the difficulty of orientating in a room or understand a simple picture merely by its raised outline without your eyesight. This blindfolded self-test also taught us, that the design of raised models of something we normally would make a flat picture of, is far from easy. We tried to grasp the context of a single picture only by its convex outlines. And we miserably failed to identify the simple drawing of an elephant. Now imagine how difficult complex scientific processes, like cloning or charge transfers, could be conveyed just by touch. As an additional hurdle, perspective cannot be used in these tactile graphics. For a blind person, there are no clues to indicate depth, removing this normally useful feature. We learned that small class size, one-on-one interactions, and teamwork amongst students with differing levels of eyesight were more effective than constant professional support. Furniture is arranged sensibly to improve acoustics and safe maneuverability. To simplify navigation, all rooms are based in part on the same layout. Everything was designed to ensure the highest autonomy possible for the students. Smart tools also play an important role in the classroom. Students have personalized laptops and take pictures of chalkboards or presentations with their smartphones to be able to zoom in to magnify details. Our visit allowed first insights on how to approach the design of our laboratory open days and enabled us to get to know students we would later tutor. 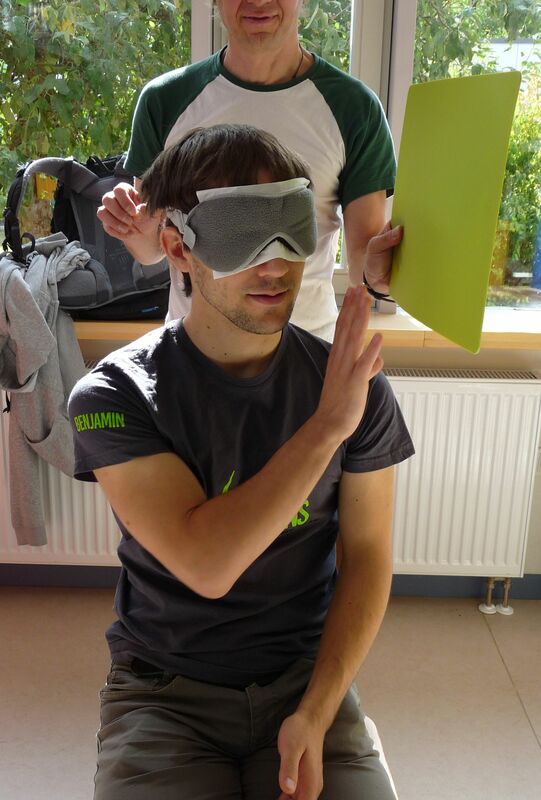 Furthermore, we could collect first experiences as tutors by volunteering at Marburg's public Hands-on-Science Lab on the Day of the Visually Impaired. 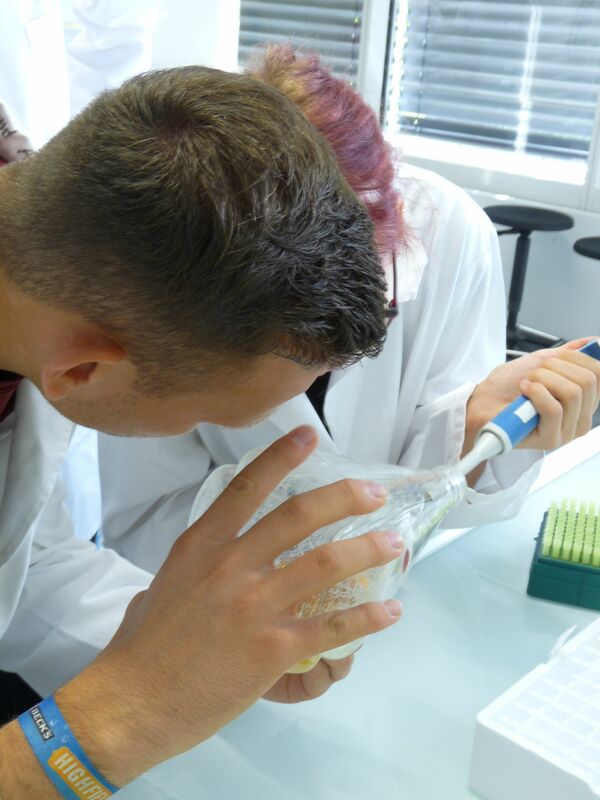 An advanced group of students, just before their A-levels, par-took in experiments to investigate the chemical differences in reactions of the same type. They displayed an analytical and observing mind, a funded knowledge that could put some university students to shame. 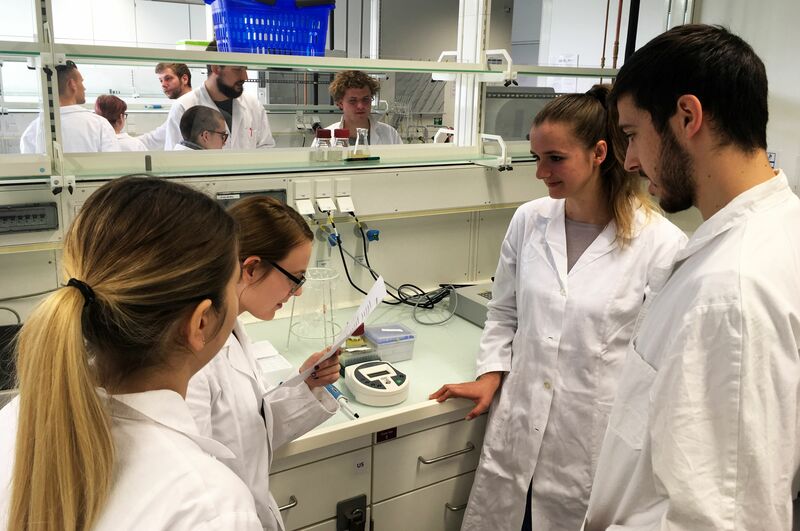 Being amazed by their passion for science, we decided to devote not one, but two whole laboratory days with study-relevant content to give them a realistic look at the natural sciences in higher education. In addition to these local experiences, we did broad research online to find additional information. It turns out that, in the English-speaking world, a number of helpful guides for laboratory work as a blind or visually impaired researcher do exist. Not so in Germany. These websites inspired further methods to be applied in a fully accessible laboratory. Open Laboratory Days - Practicing Biology and Chemistry with the Visually Impaired. Fortunately, our University is open to creative inclusive ideas. After some discussion, we convinced our Departments to allow two experimental open days for a small group of visually impaired under our supervision. Since our project is about interdisciplinary approaches to synthetic biology, we chose to design experiments showcasing aspects of biology and chemistry when introducing, Vibrio natriegens. Figure 1: Two people trying to figure out how to measure a growth curve. Throughout, we discussed our plans and layouts with the respective teachers and gained insights from consulting an educational lecturer of our chemistry department who is heavily involved with inclusive projects. In consensus with their feedback and our first-hand experiences, both days took place in the same laboratory and seminar room to make adapting as easy as possible for our students. We put great emphasis on safety by ensuring that lab coats, and if necessary safety goggles, were worn at all times. Also, we guaranteed unobstructed walkways and aided fully blind students through their new environment. The nine visiting students were divided into three groups to make assisting more simple. Figure 2: Cooperation amongst the pupils in our laboratory to measure a growth curve. To spread the news about iGEM, we first introduced our attendees to the competition before moving on to the basics of our project. We explained the essence of synthetic biology, emulating engineering disciplines and what we use bacteria for in the laboratory. Wanting to amaze the students with Vibrio natriegens we set up two different growth experiments together. The goal for the three lab groups was to find out whether they worked with E. coli or Vibrio natriegens. The students used their specialized laptops with our provided data sheets and explanation to keep track of the data they obtained for the optical density over time. Most of them had guessed the result even before the final analysis of the growth curve. So even blind high schoolers can tell the benefits of V. natriegens over E. coli. 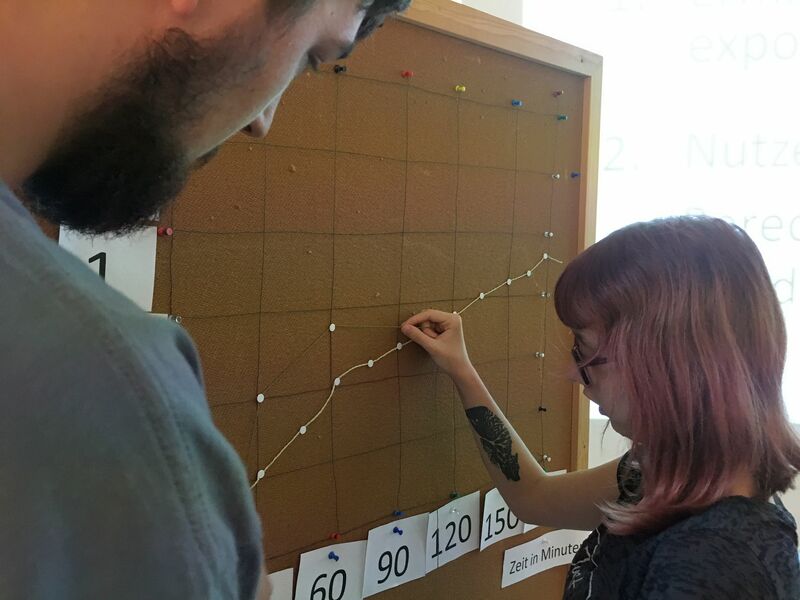 To make the results even more tactile, we weaved an enlarged wire grid on a cork board and used thumbtacks for the individual data points. These were then connected with string - so you could practically feel the growth of V. natriegens. Although we like to emphasize that the visually impaired can handle their way around a laboratory, we enhanced the experience for the students by addressing other senses than just the eyes. We implemented equipment with acoustic outputs like optophones and chemophones into the workflow of the experiments. A chemophones is a device that registers the changes of conductivity in a solution and translates the current to a buzzing sound similar to how a Geiger Counter works for radioactivity. An optophone translates different contrast to sound, changing between a high pitch and a low pitch tone. The one we used was even capable to say out loud the color that was present in a solution. but many more tricks are available with some creativity and practical thinking. 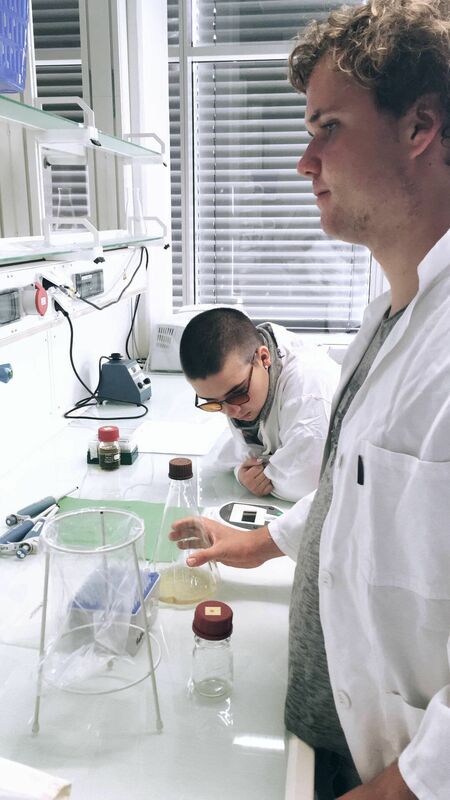 Our second day chemistry experiments were inspired by the dual nature of 3-hydroxypropionic acid, our metabolic engineering target, as both an alcohol and an organic acid. We familiarized the students with the physical and chemical properties of acids. Figure 5: Our pupils test their titration experiment with an optophone that translates colour to sound. Together, we observed the change in conductivity during a titration and tracked the color change of indicators. The optometer was then used to determine the pH of the solution and if the equivalence point was already met. To investigate exemplary esterifications, a commonly used reaction in the food and pharmaceutical industry, but also an easy method in the follow-up chemistry of 3HPA. Displaying a distinctive and often pleasant smell, many esters can be identified by adding such an olfactory dimension to the experiments. This aided the acoustic output of the chemophone and optophone. After this chemical introduction we moved on to the synthesis of aspirin one of the most common pharmaceuticals of the world. We taught the pupils how they can identify their own product by breaking it apart again. A complexation reaction was utilized to react to chemical changes of the target molecule, leaving us with color response that could once more be translated to sound. Excerpt: Study Perspective for the Visually Impaired. After our Open Laboratory Days, it didn't feel right to us to just give the pupils a taste of how much fun it can be to experiment without giving them a perspective on how to get there themselves. At first, we to had no idea how a student with poor to no vision should be able to study biology or chemistry, subjects that are still very much like artisan work, where seeing what you do is so important. So, we decided to find out! Click here to head over to our Human Practices section for more information on university politics for the visually impaired! The World-Wide-Web has the power to remove barriers in communication and interaction that many people with disabilities face in the physical world if programmed properly. Unbiased web design provides access to all people independent of ability or interface. At this point in time, a lot people with vision impairment still need to adjust web pages themselves to make them accessible to them. Why should the visually impaired be excluded from the amazing results iGEM teams achieve each year? As a part of our Integrated Human Practices project, we asked iGEM teams to design their wiki in ways accessible to people with disabilities. Through this, we aim to make the results of the iGEM competition accessible to everyone. For more information follow us to our Integrated Human Practices section. 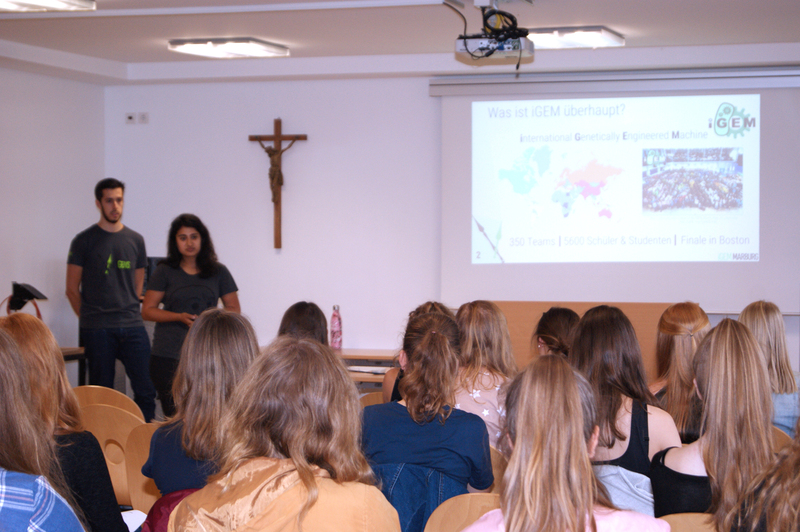 To reach out to all sorts of people of different social groups, we presented our iGEM project on the Hesse Day (dt. : Hessentag) in Korbach, as well as introducing basic biological principles. In the federal State of Hessen, the Hessentag is the biggest annual public festival. The ten-day lasting event took place for the 58th time and welcomed approximately 845.000 visitors this year. It unites the different parts of Hessen celebrating diversity, differences, integrations as well as tolerance. 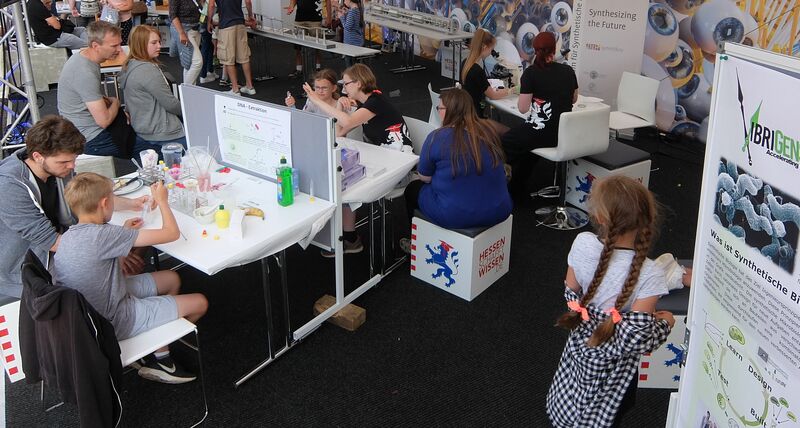 Besides a rich cultural program involving live music, arts and crafts, the Hessentag offers the space for education and knowledge transfer for everyone who is interested. The ProLOEWE initiative and "Hesse creates knowledge"
Figure 1: A side view on our activities and posters at the Hesse Day. The initiative "Hessen schafft Wissen" (engl. 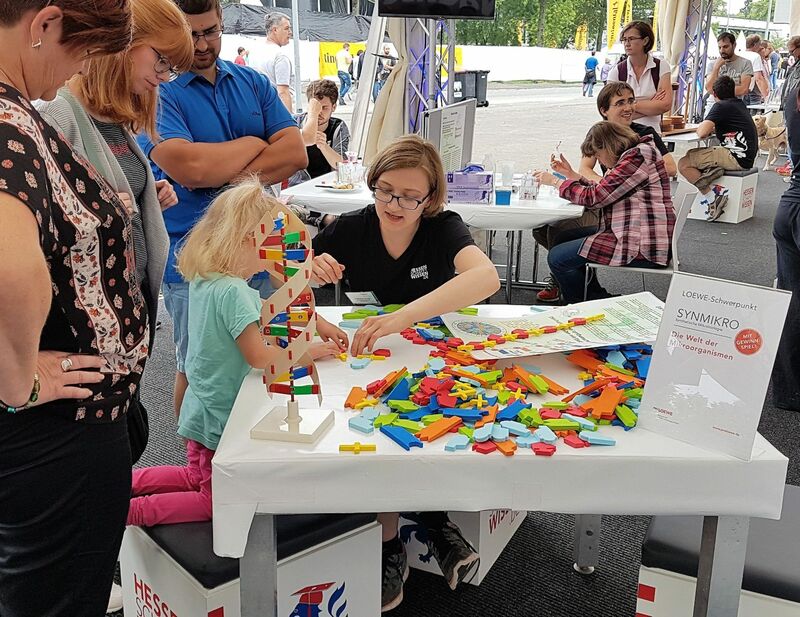 : "Hesse creates knowledge") and ProLOEWE contribute in this important part of the Hessentag by promoting the dialogue with the society and advertises Hesse as scientific valuable location. The exhibitions of various companies, organizations as well as universities arouse the interest in significant social and scientific issues while showing their work. 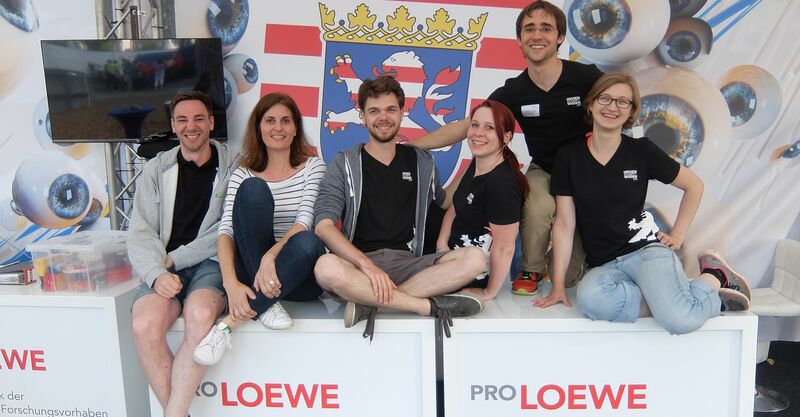 Since Synmikro, one of our main sponsors, is partly funded by LOEWE, we embraced the chance to collaborate with the PROLOEWE initiative to advertise science as an irreplaceable and fun part of Society and source of our prosperity. 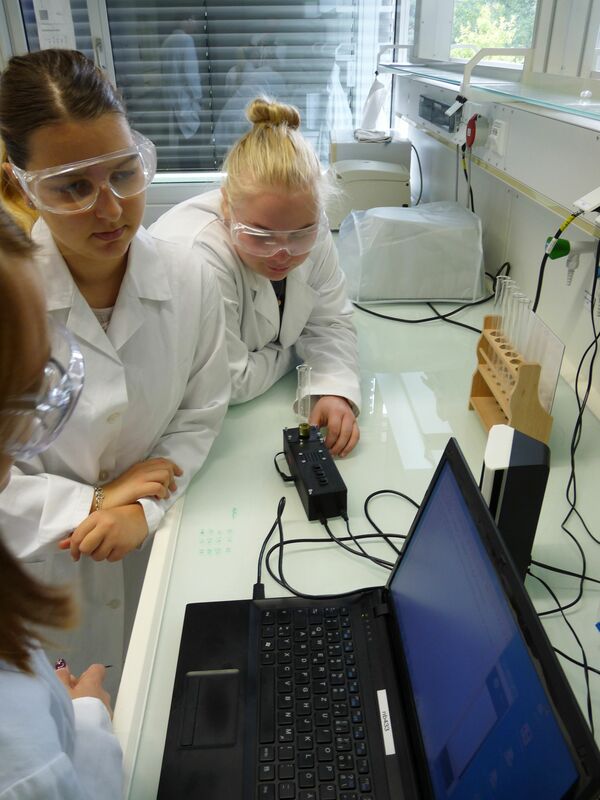 For the purpose to induct people into biology concepts and methods, we offered several child-orientated hands-on experiments on the Hesse Day. All experiments and posters we developed were united under the broad banner of microorganism and their benefit for the world - Naturally, with Vibrio natriegens as our highlight. The central activities showcasing both methods in chemistry and biology were the extraction of DNA and red cabbage as natural pH-indicator. With household items and some easy steps, the children could create their own red cabbage artwork and take their own extracted DNA home. To simplify the difficult concept of DNA, we crafted a large DNA-puzzle where a Codon-Code translated to one letter in the alphabet. Children could then write their own name on a DNA-strain to display the engineering nature of Synthetic Biology. Furthermore, by the microscopy of a hay brew and plants visitors gained insights into the life of the microcosms. We were happy to see, that not only children but also many adults were excited about the change to educate themselves about biology. We used the occasion to discuss with people who were interested in the advancements in biological topics. With the help of our posters, we taught people about microbiology and especially synthetic biology. Talking about the concerns some people have with genetic engineering we were able to calm ill-fitted fears and awaken a more educated view on modern biology. We immensely enjoyed this opportunity provided by the network that is ProLOEWE. The different perspectives and the vast enthusiasm we encountered gave us pause to think about societies' perception of science. By talking to people outside of the university and industry, we learned what the broader public is interested in, where concerns lie and how science ought to be presented in outreach campaigns to be understandable, emphasize safety and be fun at the same time. This way, we could adept parts of our project to respond to their questions and improve the way to present our iGEM Project. Synthetic Biology is a rather young area in the field of science. Consequently, many people do not know what it is all about and probably associate negative impressions with it. For instance, many people are afraid of genetically modified organisms (GMOs) and think that they are an evil. Often this fear is due to little knowledge about GMOs. To uncover misunderstanding and spread the idea of iGEM and Synthetic Biology in general, we decided to reach out to students at a local high school. In our talk we introduced the iGEM competition, Synthetic Biology and our project and visions to the pupils. More than 80 people from different classes participated and discussed about possibilities and risks of Synbio afterwards. It was amazing to see the enthusiasm of the students. We, as young scientists, also learned a lot by hearing different opinions and statements concerning Synthetic Biology which helped us to understand public concerns about Synthetic Biology. Interestingly, younger students had less fear of Synthetic Biology and GMOs than older students. We believe that media plays a crucial role in the assessment of GMOs since older students had more concerns. Fortunately, we could eliminate such fear by e.g. explaining GMOs and educating them about safety instructions every scientist has to consider. We handed out a survey to validate the impact of our presentation and discussion on the pupils. In this survey we asked about the understanding of and feelings towards Synthetic Biology before and after our talk. This survey revealed that the majority of the audience neither heard of Synthetic Biology nor iGEM but is open to get more information. This made us happy because this means that they are generally willing to expanding their horizons. To our pleasure, we got very positive feedback on our talk and the topics we introduced them to. Some of the students got interested in starting a career in science and many students are now open towards GMOs and Synthetic Biology. Our goal after organizing this event was to bypass the gap between the public and scientists and to show them, what Synthetic Biology exactly is about and which safety aspects every scientist has to follow. The students’ feedback revealed that we outreached these expectations and showed them that science and Synthetic Biology is not dangerous but opens the door to a very broad field of possibilities and applications to heal cancer, develop new drugs and understand how life is functioning. 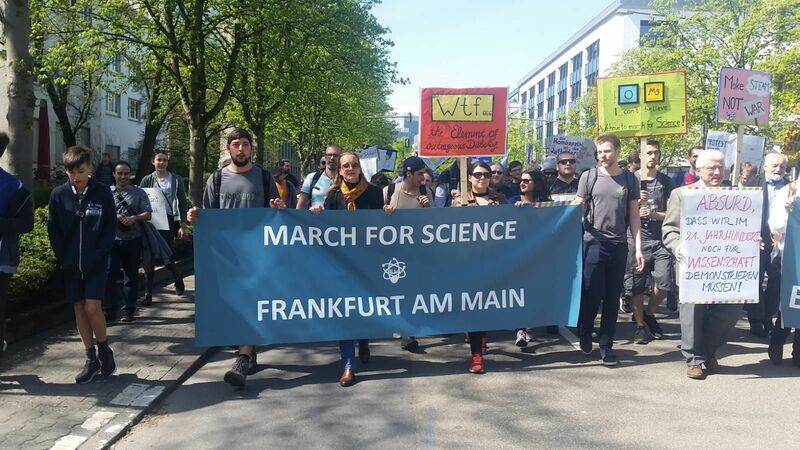 We participated in the March of Science not only because of our affiliation with iGEM but also as individuals standing for freedom in science and research in Frankfurt this year. The March for Science is a protest march started in 2017 in Washington D.C. against the suppression of science and research. When governments start ignoring fundamental problems like climate change and exclude scientific advice in general from political decisions, it becomes a slippery slope towards silencing science. The consequences are distrust towards scientific research and progress, simply because of the inconveniences meaningful and verified results create. More than one million people participated in the first march 2017 that took place in cities all over the world. This year the march was conducted again after the huge resonance in 2017. This time with more than 70 events all over the world. The intention of the march is to point out the suppression of science and their representatives by governments in many countries to stop the divergence between sciences and society. Science needs to be unrestricted by governmental despotism in order to maintain its critical and objective standpoint. Only free scientists are able to question the issues of our world and advance towards new and sustainable innovation to better and protect society’s prosperity. By marching on the streets with so many other like minded people we also want to demonstrate our support for scientists living in countries where they oppressed by their governments. Moreover, our modern days face a divide between opinions and scientifically proven facts. People spend a lot of time discussing amongst themselves or in the digital world coming to conclusions more based on someone’s opinion than on validated research. The buzzword “alternative facts” refers to fabricated lies and they harm the trust in researches and diminish the perception of science in peoples minds. However, opinionism cannot protect us from the consequences of our denial. By marching on the streets people could see that we are normal citizens like everyone else. We wanted them to put a friendly face to all the science they might fear. A person they can talk to and restore the trust in experts’ advice. Social Media displayed how many of teams participated in the March of Science this year. The result is an atmosphere of belonging and support, a sense of unison that strengthens our resolve to stand in for all things that made us fall in love with science. Something that made us participate in iGEM with our projects in the first place. We want the people to know: we are not working for profitable issues, for industries or for governments. We are young agents for our community, our continued prosperity and the betterment of our world. We fight against cancer and disease, bias, hunger, and environmental destruction. We are here and we are loud!